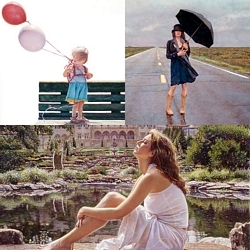 Family and the connection between them is an ever present theme in the work of Steve Hanks. His own experiences with children, parents, grandparents, siblings, husbands, wives and even pets make their way into his work. For an artist like Hanks, there was no greater gift than being able to paint the unconditional love he experienced when his children were born.